President of GJA, Affail Monney (extreme left) seated with some dignitaries at the high table. 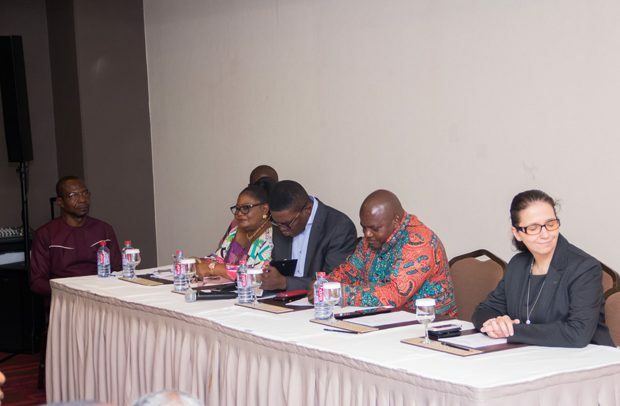 THE GHANA JOURNALISTS Association (GJA) yesterday launched this year’s edition of the annual GJA awards at the Kempinski Gold Coast Hotel in Accra. The ceremony brought together an array of journalists and media practitioners from various media institutions as well as veteran journalists from across the country. President of the GJA, Roland Affail Monney, said given the hectic and highly demanding nature of journalism, journalists need to be appreciated in order to motivate them to work harder to satisfy media consumers and also to scale up the development of the country. He disclosed that this year’s edition of the GJA awards would see the introduction of Best Radio and TV Stations, Best Newspaper and Online, as well as Female Journalist of the Year categories. He indicated that this year’s event would have about 40 different awards up for grabs as compared to 30 or 35 in previous years, adding “ every year, we scale up the quantum of packages”. Speaking on the criteria for selecting of awardees, Mr. Monney said it would mainly be on impact. “The number one criterion is impact. How has your story addressed issues? How has your story improved lives and stopped crimes? “And then we also look at some of the virtues that underpin our profession such as accuracy, balance, fairness, research and context”, he said. Guest Speaker at the launch, Prof. Emmanuel Asante, urged journalists to be objective in their reportage and churn out accurate news stories devoid of sentiments. He said the media has a role to ensure that state institutions are doing their work and journalists have the responsibility to hold public officers to account in their news reportage. Journalists should take into account several issues such as the political and social economic effects of the story. This year’s GJA awards ceremony is slated for Saturday, October 20, at the Kempinski Gold Coast Hotel.